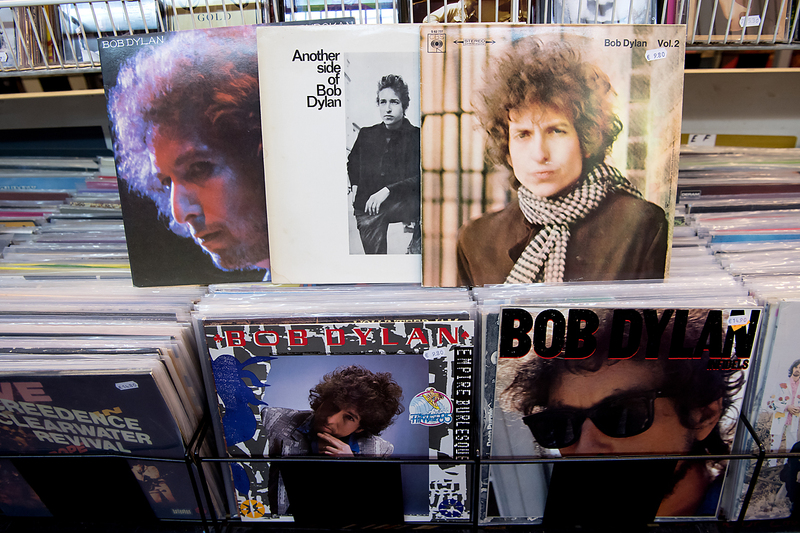 The records 'At Budokan', 'Another side of Bob Dylan', 'Blonde on Blonde, 'Emprie Burlesque' (bottom-C) and 'Infields' (bottom-R) by US singer-songwriter Bob Dylan lie in a record store in Munich, Germany. Dylan won the 2016 Nobel Prize in Literature, the Swedish Academy announced in Stockholm on Oct.13, 2016. The unexpected decision to award the Nobel Prize for Literature to the American poet and musician Bob Dylan “for having created new poetic expressions within the great American song tradition” – announced on Oct. 13 – has generated earnest discussion in Russian literary society. RBTH publishes the most entertaining comments from prominent Russian critics and writers. It seems to me that the Japanese writer [Haruki Murakami] would have been a more appropriate candidate, because this is truly profound literature, philosophy, style, a new aesthetic. Yet again here we have further defilement, the defilement of world culture. What the hell did they give it to Dylan for? Yeah ok, he has good writing. The Nobel Prize could have been given to some decent, deeply literary old-timer. They’ve set the precedent now, this news story is amazing and gives us plenty to write about – but is there any use for literature? Not a sausage. I think that the whole musical world is extremely happy, because the Nobel Prize in its lifetime has never been awarded, unfortunately, to any of the late rock-poets: John Lennon, Jim Morrison, Bob Marley and many other guys who wrote wonderful verses, but which weren’t in the right format to be able to receive a prize. Dylan has been the first to break through that barrier. I hope that Dylan won’t be the last. Leonard Cohen, Neil Young and even in our country Boris Grebenshchikov, Andrei Makarevich, Yury Shevchuk and other wonderful poets are all still very much alive and well. This gesture from the Nobel Committee shows that the U.S. is not just Trump and Clinton, but has meaningful art and wonderful poets too. It is a demonstration of a different America to the whole world and I think a good signal. I am truthfully quite happy that the Nobel Prize in some century has chosen a really talented person and not just some political puppet. Many remind us of Dylan’s Jewish heritage and his Odessan roots. It came upon him, the shopkeepers’ son – all descendants of emigrants from the Russian Empire – to marry the electric energy of the new music, rock and roll, with the furious civic consciousness from the Protestant “founding fathers” – and with real poetry. I won’t be the one to say that he was just a musician. He is exactly one of those people who drove musical poetry forward, just like Jim Morrison, Leonard Cohen… Dylan is an outstanding poet, a believer in the Nobel’s ideals of humanism. Since around 1965 his poetry has been known all across the world, and people exchange quotes from it. Why not give it to him? This award is to encourage [different] regions, genres, and methods. It puts a stamp on it, saying “pass,” “first class,” “step right up.” Millions of writers from the same region, genre or method as a result understand that their work isn’t worthless. But Mo Yan didn’t get it, and neither did Chinese literature. Alice Munro and the narrative genre didn’t get it, and neither did Svetlana Alexievich and polyphony, and so on. Bob Dylan didn’t win it this year; the solidly American tradition of sung poetry – with a global range – was the one that won it.